The letters in English language, make up words. While no word is less or more than another, one could view a word that appears before another in the dictionary is less than that word, and a word that appears afterwards is more. By this definition, identical words are the same. Parsing a file is when you read a file to collect information from the file. In this assignment, you will parse a file, and put all of the words in a Binary Search Tree. You will use the Binary Search Tree to collect data about the number of times a word was found in the file. The first word you encounter will be the root. If the next word is greater, put it to the right. If it is less, put it to the left. It is possible that the tree you make will be very sparse. Assume all words in the file are lower case or covert them to lower case. After you have loaded the file into your Binary Search Tree, the program should display the in-order, pre-order & post-order traversal of the Binary Search Tree. The user should be given the chance to type a word. The computer should say the number of times the word was found in the file (zero or more). The left sub tree of a node contains only nodes with keys less than the node’s key. 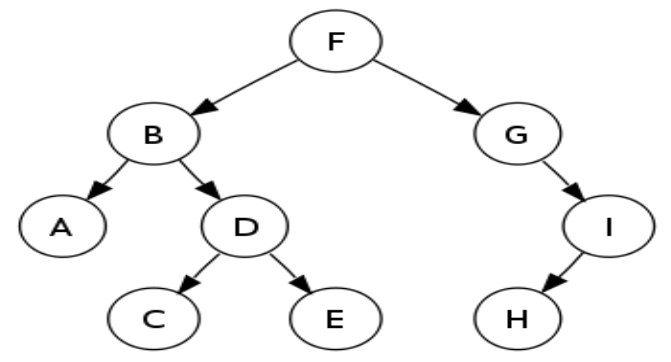 The right sub tree of a node contains only nodes with keys greater than the node’s key. The left and right sub tree each must also be a binary search tree. Algorithm and search algorithms such as in-order traversal can be very efficient. Letxbe a node in a binary search tree. Ifyis a node in the left sub tree ofx, theny. key x. key. Operations, such asfind, on a binary search tree require comparisons between nodes. These comparisons are made with calls to a comparator, which is a subroutine that computes the total order (linear order) on any two keys. This comparator can be explicitly or implicitly defined, depending on the language in which the binary search tree was implemented. Searching a binary search tree for a specific key can be a recursive or an iterative process. We begin by examining the root node. If the tree isnull, the key we are searching for does not exist in the tree. Otherwise, if the key equals that of the root, the search is successful and we return the node. If the key is less than that of the root, we search the left sub tree. Similarly, if the key is greater than that of the root, we search the right sub tree. This process is repeated until the key is found or the remaining sub tree is null. If the searched key is not found before a null sub tree is reached, then the item must not be present in the tree. Insertion begins as a search would begin; if the key is not equal to that of the root, we search the left or right sub trees as before. Eventually, we will reach an external node and add the new key-value pair (here encoded as a record ‘new Node’) as its right or left child, depending on the node’s key. In other words, we examine the root and recursively insert the new node to the left sub tree if its key is less than that of the root, or the right sub tree if its key is greater than or equal to the root. Deleting a leaf (node with no children):Deleting a leaf is easy, as we can simply remove it from the tree. Deleting a node with one child:Remove the node and replace it with its child. Deleting a node with two children:Call the node to be deletedN. Do not deleteN. Instead, choose either its in-order successor node or its in-order predecessor node,R. Replace the value ofNwith the value ofR, then deleteR. It could be O(n^2) even if the tree is balanced. Suppose you’re adding a sorted list of numbers, all larger than the largest number in the tree. In that case, all numbers will be added to the right child of the rightmost leaf in the tree, Hence O(n^2). The numbers will be added as a long chain, each node having a single right hand child. For the i-th element of the list, you’ll have to traverse ~i nodes, which yields O(n^2). "Research Assignment on Data File Structure." UKEssays.com. 11 2018. All Answers Ltd. 04 2019 <https://www.ukessays.com/essays/information-systems/research-assignment-data-file-9699.php?vref=1>. "Research Assignment on Data File Structure." All Answers Ltd. ukessays.com, November 2018. Web. 19 April 2019. <https://www.ukessays.com/essays/information-systems/research-assignment-data-file-9699.php?vref=1>. UKEssays. November 2018. Research Assignment on Data File Structure. [online]. Available from: https://www.ukessays.com/essays/information-systems/research-assignment-data-file-9699.php?vref=1 [Accessed 19 April 2019]. UKEssays. Research Assignment on Data File Structure [Internet]. November 2018. [Accessed 19 April 2019]; Available from: https://www.ukessays.com/essays/information-systems/research-assignment-data-file-9699.php?vref=1.